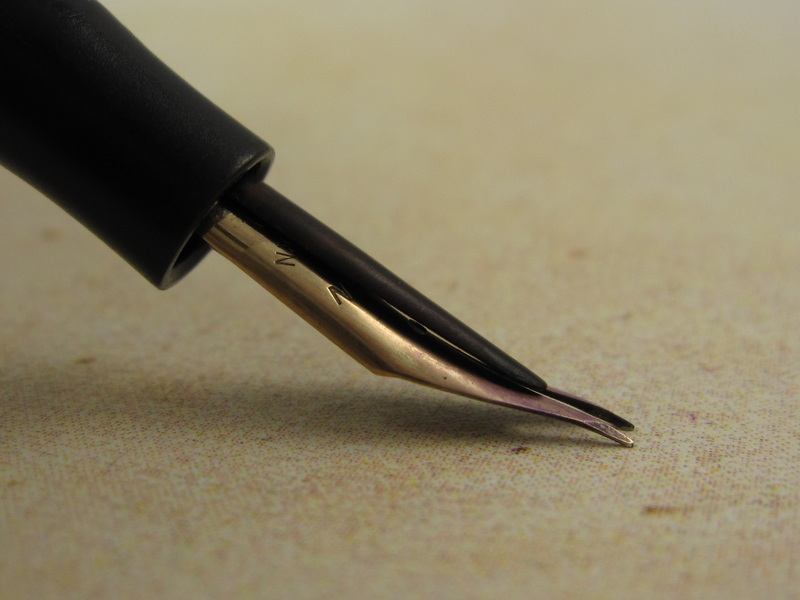 This article focuses on flexible nibs for fountain pens. Quills and dip nibs were widely and effectively used for centuries before fountain pens and gold nibs existed. Some of the most beautiful handwritten documents, both in manuscript and drawing form as well as the best books and manuals teaching the most elegant forms of vintage penmanship were written with the use of quills and dip nibs. The most famous authorities in penmanship used quills and dip nibs during their lifetimes. Portability, the ability to carry those writing instruments in your pocket, the elimination of interruptions through the continuous need to dip them in an ink reservoir to replenish ink, lower probability of ink accidents, corrosion, and long-term durability of the nibs were the factors that opened the path to the advent of fountain pens and gold nibs. The ability of a fountain pen to carry ink within its barrel combined with gold nibs with iridium points that could last a lifetime deeply impacted the world of writing instruments in the 1880s. change of nib, without a single incapacitating accident"
Quills and dip nibs are, without a doubt, the predecessors and the inspiration for fountain pens and gold nibs. Highly professional calligraphers and artists in our time still use dip nibs and their abilities with these writing instrument are beyond exceptional. These individuals are indeed masters in the field of performance flexible writing and drawing. This is the second most important element, after flexy writing skills from the writer. In flex writing, the nib is where the action takes place. prior to those pens being shipped to the marketplace. Lots of skillful handwork and craftmanship took place to attain the high caliber of a performance writing nib. nibs have either closed or are under different ownership, the fact there are less companies making nibs, lots of writers not knowing how to properly hold a fountain pen and even less of them knowing how to use a flexible nib ... all these and other factors have changed the approach to make flexible nibs. Modern nib making does not include forging. Gold rolling is a great metallurgical process, but it does not achieve the same high levels of elasticity, flexibility and responsiveness found in forged nibs. Rolled gold Vs. forged gold is the main contributor for the tremendous difference between the performance of vintage and modern flexible nibs. Furthermore, there is less personal inspection and tunning in modern nibs. Machines are incapable of performing all the necessary writing tests in a flexible nib. They are not able to feel how these nibs perform and cannot conduct the necessary micro adjustments. The high skills, craftmanship and institutional knowledge of flexy nib makers and tuners from the golden era of flexible nibs have been gone for a couple of generations now. This is indeed very regrettable to those passionate about vintage flexible nibs. To this date, no modern pen or nib manufacturer has been able to replicate the true attributes of a real vintage flexible nib, no one! Example: The vintage Esterbrook J-series pens are wonderful fountain pens made in the 1940s and 1950s. Many of them are still around, looking and writing like a new pen. The Esterbrook pen company labeled and offered multiple types of "flexible" nibs made of very rigid steel for their J-series pens. As good as Esterbrook pens are, their so called "flexible" nibs in J-series pen are incapable of achieving the flex writing performance found in the true vintage flexible nibs made by other pen manufacturers earlier. Why? In order to offer a very affordable pen to the masses, Esterbrook eliminated many features, and among them a high quality nib, which is the soul of a flexy nibbed fountain pen. Esterbrook nibs in the J-series pens were made of rigid steel with less metallurgical steps and tempering as used by most of the earlier pen manufacturers. And as such, Esterbrook “flexible” nibs in the J-series pens are virtually nail nibs capable of spreading the tines apart, forming a “V” shape in the slit of the nib (like the blades in a pair of scissors). However, the tines barely arch when flexed like a true vintage flexible nib. The inability of the nib to have the desired elasticity and substantially arch its tines is a HUGE detriment to true flexy writing. By having two rigid steel tines spreading out, you can get line variation, but only under huge amounts of pressure. They have very little responsiveness. They are in fact, lethargic nibs with close to zero responsiveness. Furthermore, the pressure needed the spread the tines is so high that these nibs are prone to scratching and railroading, becoming a distraction to the proper control of the pen, good penmanship, to the joy of flexible writing and to provide that unique feeling that only a true vintage flexible nib can provide. They are prone to tine misalignment, and that extreme pressure exerted against the feed and section of the pen restricts ink flow and increases the probabilities of damage. This is not what I consider "true flex"
... Watch the magnificent arching and elasticity in that nib!!! Note: Please do not attempt to flex the tines of your nib to its maximum capabilities unless you know what you are doing. You can misalign, bend or break your nib beyond repair. It is not worth to damage a nib just to see its maximum flexing capabilities. Over time and with practice, your skills to determine the degree of flexibility in a nib will become more natural. that will hold a significant amount of ink in its reservoir, that is portable and will not leak, spit, burp or need to be primed or shaken to write consistently, with an ergonomical shape that will be pleasant to hold, easy to control, be aesthetically pleasant to our eyes, and built of materials and craftmanship that will last for generations to come. Example: The Pilot Falcon Namiki pen is a great high quality modern fountain pen. One of its models is called “Soft Fine” which some pen enthusiasts regard it as a "modern flex" nib. The nib in this pen will do superbly well for normal writing and with modest to medium line variation and medium flex pressure applied. But once you flex this nib significantly, the nib will arch substantially, creating a huge gap between the nib and feed, and causing the nib to be starved almost completely. Ink flow becomes so inadequate, you have to release all pressure from the nib to allow the pen to replenish ink in the feed. Furthermore, the nib in this pen has average responsiveness, but it is unable to make those very fast returns (snap-back) once pressure is released. The fact this nib was manufactured through the rolled gold process will never allow it to enjoy the responsiveness of a high performance vintage flexible nib. Like most Japanese products, the Pilot pen company has been making extremely high quality pens, nibs and inks for many decades. I use them and love them. The Pilot pen company has not made false claims about this product, but some folks have "promoted" this pen to levels way beyond of what it was designed for. The design of this pen will never allow for high performance flexy writing because it was never intended for those purposes. 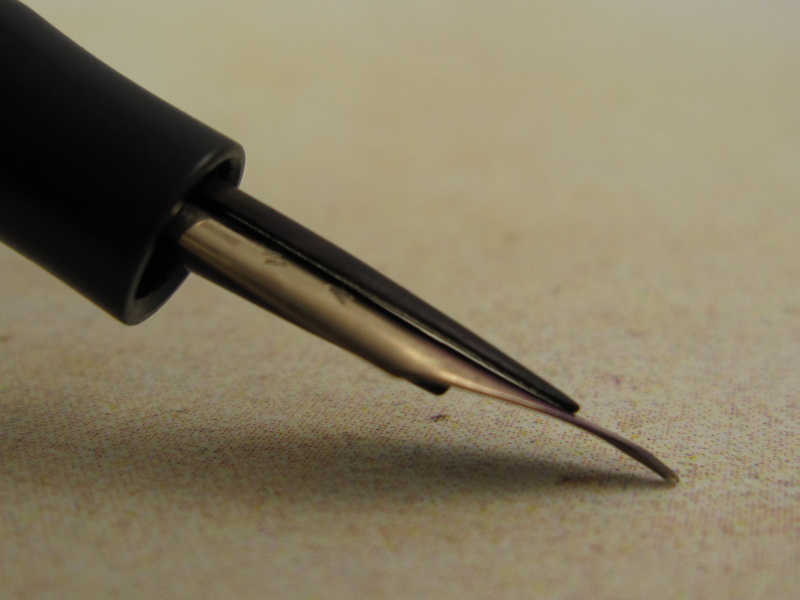 Inadequate setup of the nib and pen, including the pen's internal components, will not allow them to perform to their maximum capabilities. The ink supply (ink flow) in a pen with a flexible nib is way more complex than in a pen with a firm nib. Flexible nibs have different ink demands as flexible writing involves writing at different speeds, different pressures applied to the nib, very thin and very thick lines, quick and instant switching from thin to thick, thick to thin, slow to fast, fast to slow, writing in different directions, etc. Imagine an F-16 fighter jet taking off at its maximum speed, raising to high altitudes in seconds, making lots of swift turns, fast descents, all different types of maneuvers, a precision landing on a moving aircraft carrier navigating through rough waters and the forces of the wind, instantaneous speed reductions and massive braking power. This is somehow of a similar scenario to which nibs are exposed in high performance flexible writing. And for the pen and nib to be able to keep up with these different and changing demands, they need to be properly setup for such requirements. Do not expect a simple sac replacement and some cleaning will do the trick. Even some folks with lots of comprehensive knowledge and experience in pen repair may not achieve maximum high performance with a flex nibbed pen. Why? 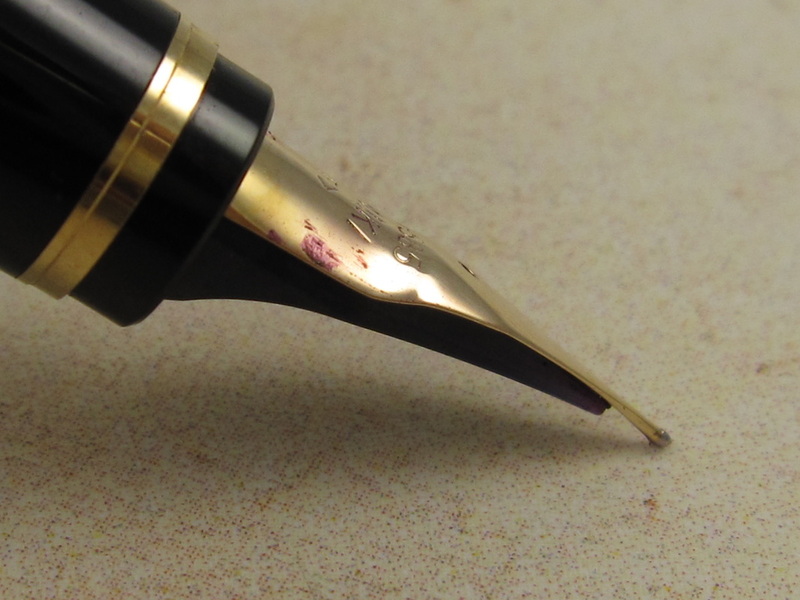 Skills at writing with a flexible nib are just as necessary as comprehensive knowledge of fountain pen repair. How can that individual check the performance of the flexible nib if that person can only do some doodles with a flex nib? In order to excel in setting up a high performance pen with a flexible nib, an individual will need to master flexible writing to experience and feel the behavior of the pen and the flex nib during all the changing demands required from the pen and nib. It takes a lot of finesse to observe and feel the behavior of the pen and to properly setup that flexible nib into a fountain pen for high writing performance. ​Waterman pen is perhaps not properly setup and it may have substandard performance, but not the maximum capabilities it can achieve; (2) That individual is perhaps unable to properly identify the very particular nuances of flexible nibs and high performance flexible writing ... and even less to use those writing instruments to what they were designed for. This is the least critical factor of the six as most fountain pen inks in the marketplace are good and adequate for writing with flexible nibs. Options of brands and colors are richly abundant and it will be more to the user's personal preferences. Likewise, different inks have different color shading, drying times and other properties which will be up to the pen user to decide according to his/her preferences. The only critical elements here are: (a) To stay away from inks that are prone to clogging pens. Remember: Ink flow is very critical with flexible nibs. 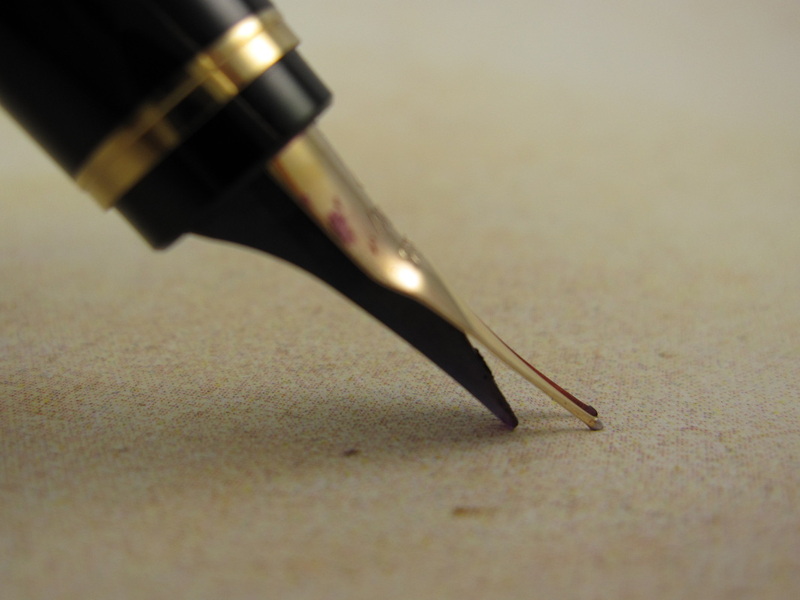 Clogging will undermine ideal ink flow; and (b) Regardless of the ink you use, flushing the pen periodically is a great practice to achieve and to maintain the good performance of a flexible nibbed pen. Please do not leave pens inked and unused for longer periods of time. Even if you had a wonderful performing pen, the peformance of your pen will be lowered dramatically after old ink has started to dry inside the inner components of the pen. Unlike inks, paper plays a more important role with flexible nibs as these nibs can lay lots of ink on paper, increasing the possibilities of feathering and bleeding. There are friendly types of paper in the low, medium and high price ranges. Paper finishes and processes vary from country to country. I have been very successful with regular inexpensive paper used in computer printers, the reasonably priced “Bagasse” and “Sustainable Earth” proprietary lines from Staples, and Rhodia. Rhodia is the most expensive among the ones mentioned here, but they have been my favorite for quite some time. In fact, most writing samples in this website have been made using Rhodia Block 13 paper with 5x5mm squares. As good as Rhodia paper is, do not expect it will perform well with all pens, nibs, and inks. The toughest selection of paper is when you are using extremely flexible and thin nibs, including dip pen nibs that have an ultra thin point. These nibs seem to be sometimes capable of either catching the fibers of the paper or slightly tearing the outer layer of the paper when significant pressure is applied, creating the unwelcomed feathering and/or bleeding problems. In situations like this, I resort to trial and error, including inexpensive papers until I find a good suitable match between that particular nib and paper. Flexy writing skill is by far the most critical element in high performance flexy writing. It allows a flexy writer to maximize the performance of any writing instrument. Mastering these skills will allow the writer to effectively assess and grade any fountain pen, flexible nib, paper and ink properties. The great news are that no one was born with flexy writing skills. All skills are acquired over time and with practice. We are all more inclined to like and acquire certain skills better than others. There is tremendous satisfaction to observe our own progress during the learning experience. And what a better excuse to put our beloved fountain pens to good use than learning to improve our writing skills. I have yearned to learn to master writing with a very light hand when using ultra flexible and ultra thin nibs since 2008. I have finally commited to invest little bits of time on a daily basis. This is exactly where I am as I edit this new page in the website today, November 23, 2011. It is 6:45 AM on Thanksgiving Day, and I just finished the last marinating touches on the turkey and placed it in the oven. I will have to be watching this turkey every 20 or 30 minutes for multiple hours this morning. Well, I will also use a couple of those 20 minute intervals to practice very light writing with those very flexible and thin nibs. Last night, I grabbed a very nice Mabie Todd Swan pen from the 1910s from my personal collection, flushed it, and filled it with Sheaffer Blue Black ink. This is a classic darker ink color that leaves beautiful shading effects and that vintage looking color. The anticipation the combination of this pen, nib and ink has been huge and pushing myself hard to try to practice writing with a very light hand will be a sideline. Depending on the final results of these short sessions today, I intend to try the new Diamine Meadow ink with this same pen and nib tomorrow. If it gets extremely hard, I will take it a notch lower and grab a friendlier and more forgiving pen/nib, but I will not give up in the process. Do you see what entices me to go practice and enhance my flexy writing skills in this pattern? This same basic tool is what I have been using since 2006 to improve my handwritng after more than a decade using ball points and neglecting my penmanship. It is a very basic but proven tool for me, that will certainly ease the transition to learn and master the Copperplate handwriting method ... and hopefully many additional vintage writing methods afterwards. I am "learning to crawl before I run" so to speak, and it is quite enjoyable to be crawling like a baby with all different pens, nibs and inks. The writing sample below is after two weeks of practice, and after investing a little time here and there. As you will notice, my hand is till fairly shaky with those very thin and light handed strokes, but I can assure you that I am having one of the best times in my life getting my feet wet into learning these new writing skills. With determination and practice I will get there. In the meantime, I feel like going to the candy store every session I have. I truly hope that sharing my personal flexy writing skills journey encourages you to get started, looking forward, and having huge anticipation of the great results your handwriting skills will achieve if you invest a little time on a regular basis. It is as simple as enhancing your flexy writing skills while having fun with your writing instruments. Now, how cool is that? ... well, the turkey is ready now!!! It looks delicious and juicy. These flexy handwriting exercises have made my hungry and I have to go eat now. Happy Thanksgiving Day to everyone!